I was fortunate to discover Nate Silver, founder of 538 and his uncanny accuracy in predicting outcomes of political contests long before he was "famous" and even longer than before he was hired by the New York Times. And YES, he IS that good. Whatever the outcome of the Nov. 2 elections, you can be certain that commentators around the country will be fixated on the impact of the Tea Party movement. If Republican candidates do well on Election Day –- and particularly if Tea Party-backed candidates like Rand Paul of Kentucky and Sharron Angle of Nevada win their races -– the Tea Party will be credited with having revived a moribund Republican Party. But if the Republicans fail to live up to expectations — and expectations are exceedingly high –- the Tea Party will be blamed for curbing the Republicans’ ability to capitalize on historic levels of voter dissatisfaction. FiveThirtyEight’s mission is to help New York Times readers cut through the clutter of this data-rich world. The blog is devoted to rigorous analysis of politics, polling, public affairs, sports, science and culture, largely through statistical means. In addition, FiveThirtyEight provides forecasts of upcoming presidential, Congressional, and gubernatorial elections through the use of its proprietary prediction models. You are out of step with the leader of the prediction "pack" if you are following Nate. I urge you to follow through to the full post with charts and data elements that is very easy to understand, yet is about as complex as it gets. That is the mark of a great prognosticator, in my book. The economy goes in and out, and from time to time the US manufacturing sector booms. 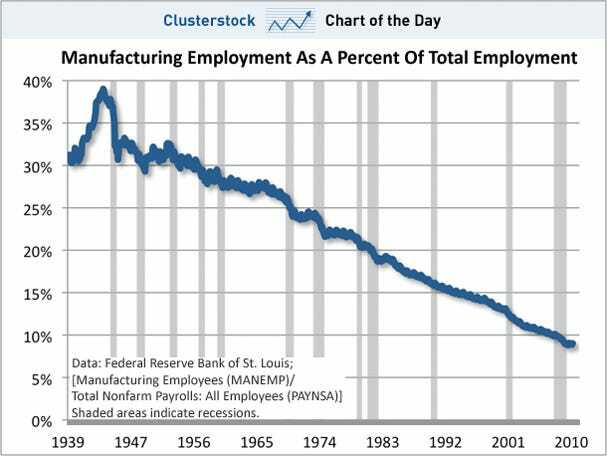 But this chart, put together by Paul Kedrosky and published by Business Insider yesterday, makes it pretty clear: as a share of total non-farm payrolls, manufacturing jobs are only going in one direction (off a cliff). Since before President Obama was even born, no real variable, It's just a straight line sloping down. In my opinion, even if you are working in this economy, make it a point to visit Business Insider daily.